The White House Correspondents’ Dinner—or what our absent president called, “a large group of Hollywood actors and Washington media…consoling each other in a hotel ballroom”—occurred rather unnecessarily and awkwardly but still with plenty of humor on Saturday night. 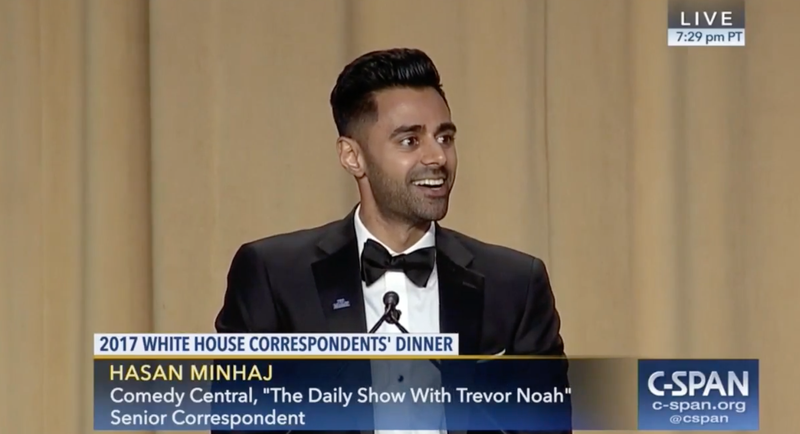 The Daily Show’s Hasan Minhaj delivered the keynote comedy routine under conditions that couldn’t be worse for lightly teasing the America empire, given that Trump and his administration, aside from not being there, have made it clear that they have nothing but disdain for a free press. Usually the only fun part about watching the WHCD is seeing world leaders squirm with embarrassment, or let a smile slip, or lose their composure in any way—that’s how you know the comedian has done their job. Without that, you might as well be tweeting jokes at realDonaldTrump, or blogging into the void. Having said that, Minhaj did a great job with a weird and joyless situation. You can watch Minhaj’s speech in its entirety below.